Bought at a garage sale is this lovely 51/4 pitcher with identification marks on the bottom. 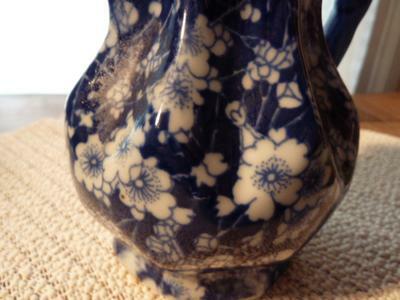 It is heavy, has a good pattern & glaze and I feel it is a good piece. Can you identify it? Thanks to Peter for clear explanation of why it can be seen that this is a late 20th-century item. 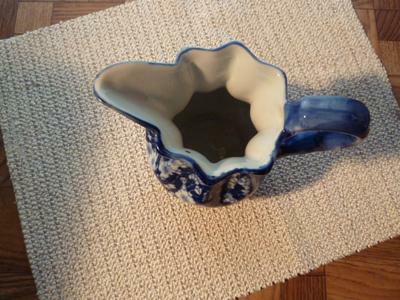 In addition, this is a cream or milk pitcher that would be part of a mass-produced tea set for export to USA or part of a mass-produced breakfast set for cereal (bowl, pitcher, underplate and possibly a sugar container) also for export. While there are some people who like just the odd cup-and-saucer left over from broken sets, or who like just the small pitchers, the pieces should be understood as being out of their larger-set contexts. In my view this is either Japanese or a more recent try at copying a Japanese style - made in China. I tend to believe it is the latter. 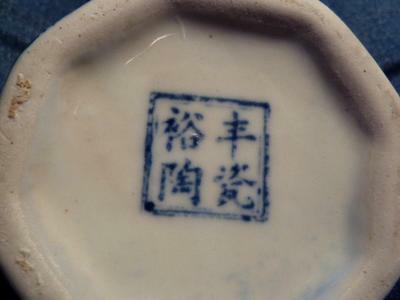 The style and decoration of this look Japanese, but the mark is wrong.